When you will start the Acronis True Image Home 2010 you will see a welcome screen with a common tasks and a short information about your last backups. Acronis True Image is famous for its imaging backup method. This backup saves all the data from the hard disc to one large file which can be used to recover your system, applications and data very fast and without installing them again. The new version Acronis True Image Home 2010 has some cool features. The default backup image in the TIB file could be easily converted to VHD image. And as you probably already know, VHD images are virtual disk drives for Microsoft Virtual PC or Hyper-V. They can also be used to install and boot Windows 7. 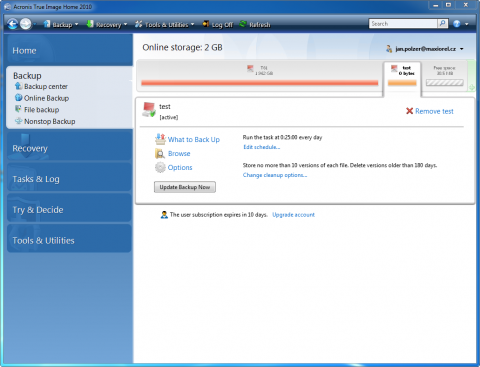 This means with Acronis True Image Home 2010 you can create backup of your computer and then start it using the virtual computer. Moreover, Windows 7 Ultimate is able to start on a different hardware from the backup image. So if something will go wrong with your current computer, you can restore your backup on a different machine and continue with your work. That’s great! 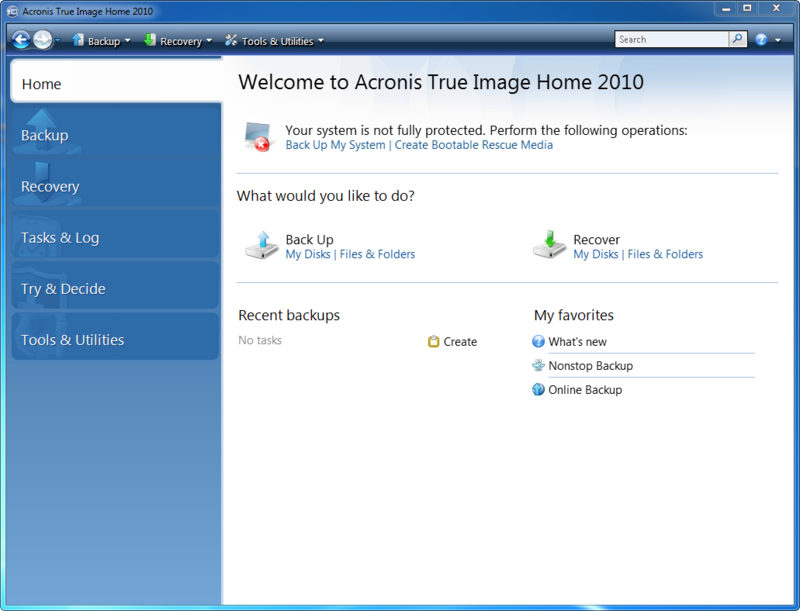 Another new feature in Acronis True Image Home 2010 is online backup storage support. Click the Backup and Online backup button in True Image window. Then you can register or log in to your online account. 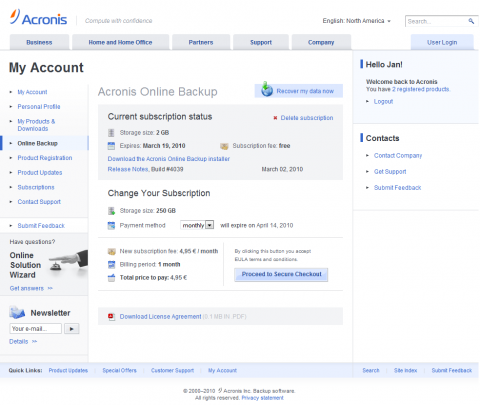 The online backup storage from Acronis is a paid service. You can start with trial 2 GB account and if you will like it, you can continue with 250 GB for 4,94€ per month. This is very good price I think. Of course, the online backup needs a quality and fast internet connection if you would like to transfer large amount of data. Online backup doesn’t store the whole image, it works only with selected files and folders. When you will close the main True Image window, the small app will continue with uploading files. You can check its icon in the system bar. So at first, select the files and folders you would like to save to online backup storage. As the second, set the password for encryption your data to be sure that you will be the only one who can see them. And after that start the backup process. 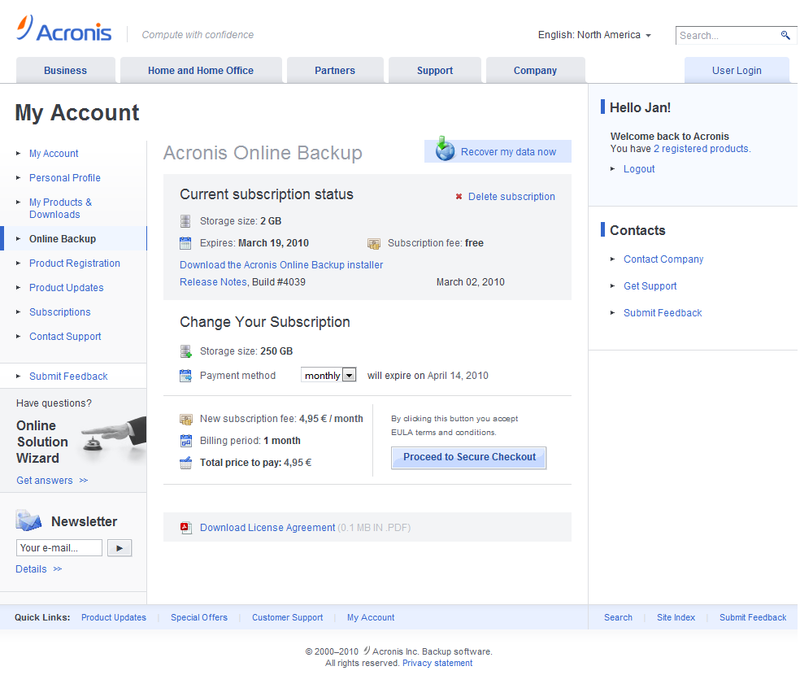 Acronis provides a web interface for your backup storage at www.acronis.com. 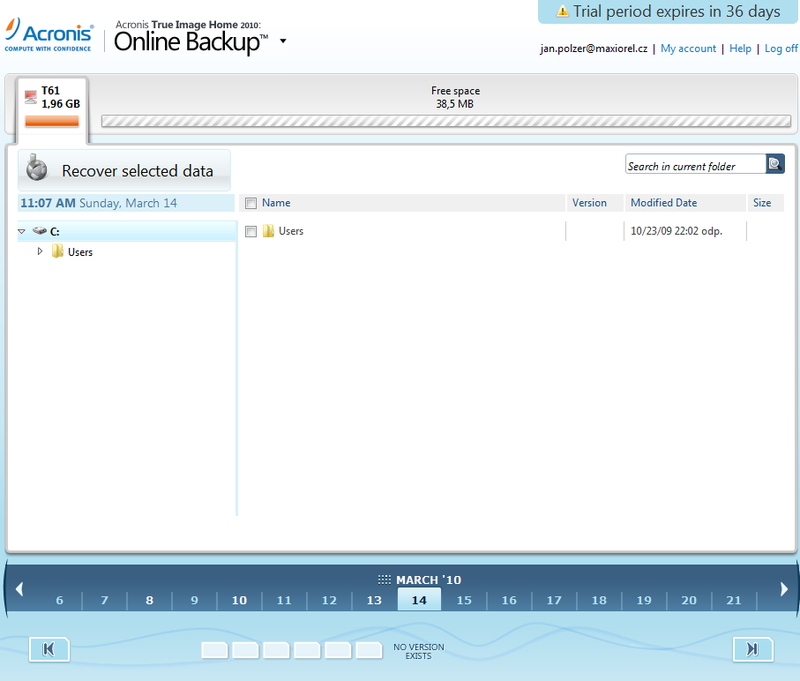 Just log in to your account and go to the Online Backup section. You will see an information about the current state of your online backup storage. To browse your data click the Recover my data now link. The new window/tab of your browser will be opened. Provide your encryption key and wait until the web interface for your data will appear. Then you can go through your online data as in the desktop’s Windows Explorer. Use the calendar browser at the bottom to simply filter the backups. You can also try the search feature. I’m living in Czech Republic and for us the Acronis Online Backup has some problems currently. Online Backup storage is from time to time unavailable, restoration via the web interface will give you empty files and the backup process fails sometimes. But what I know from Acronis guys here, the problems should be only for the Czech users. The world wide users shouldn’t notice these troubles. I will be grateful if anyone from BackupHowTo.info readers will let me know via the comments how the Acronis Online Backup works for him or her.